Charleston, WV – In an effort to meet the growing need for Science, Technology, Engineering, and Math (STEM) skilled graduates in West Virginia, today The Education Alliance announced $1.2 million dollars in grant funding for the Blended Learning initiative. The Blended Learning program will help teachers in seven rural West Virginia schools “blend” face-to-face instruction with online resources to provide engaging, technology-rich learning opportunities for students. 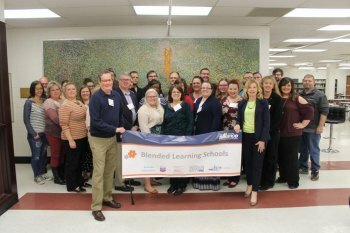 The Blended Learning Schools program, sponsored by The Education Alliance, provides resources including a $15,000 Makerspace grant, funding for teacher professional development, and a Volunteer in Service to America (VISTA) position. Face-to-face instruction will be enhanced through Makerspaces in each school that enable handson, project-based learning. “As we prepare our students to compete in today’s global workforce, it is critical we continue to engage students by providing increased access to science, technology, engineering and math learning opportunities,” said Dr. Amelia Courts, president and chief executive officer of The Education Alliance.